The year 1837 saw the beginnings of mass immigration to the Willamette Valley from the Eastern United States. The Willamette Valley, described to Americans in the East as an “Eden of the West,” had been shaped by millennia of active land management by a diverse native population including the Kalapuyan, Molallan and Chinookan. The area – still within sovereign Native nations – proved enticing to immigrants hoping to settle on land in a conducive climate. These immigrants were mainly retired fur trappers and traders and farmers, but were soon followed by tradesmen, merchants, and professionals. With their combined seeds, trees, and techniques, the two men founded the non-native nursery and fruit industry in Oregon. 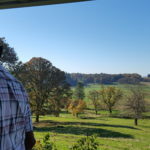 Luelling planted his trees on his donation land claim just south of Portland in Milwaukie and traded with Geer for rootstocks, enabling success through their cooperation. 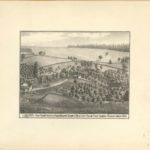 By 1852, Geer advertised 66 varieties of apple trees, 15 varieties of pear trees and assorted peach, cherry, plum, nectarine and almond trees for sale in the Oregon Statesman newspaper. The economic boom resulting from the California Gold Rush created a rich market for both trees and fruit. Today, the Geer farm east of Salem still has trees growing from the original plantings. 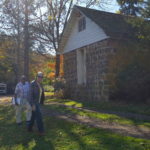 GeerCrest Farm is now managed by the nonprofit GeerCrest Farm & Historical Society, Inc. Their mission is both preservation of history and farm-life education for children. The farm has two buildings on the National Register: the 1880 stone fruit cellar and the 1851 farmhouse, which is the oldest residence in Oregon that remains in the original family. Standing near the farmhouse is a grove of fruit and nut trees that date back to the beginning of the Geer homestead. In recognition of the early non-Native Oregon nurserymen and fruit growers, the Oregon Heritage Tree Program welcomes these venerable trees into the 2018 class of Oregon Heritage Trees.